Credit: Bruce Macaulay. FOX Broadcasting. 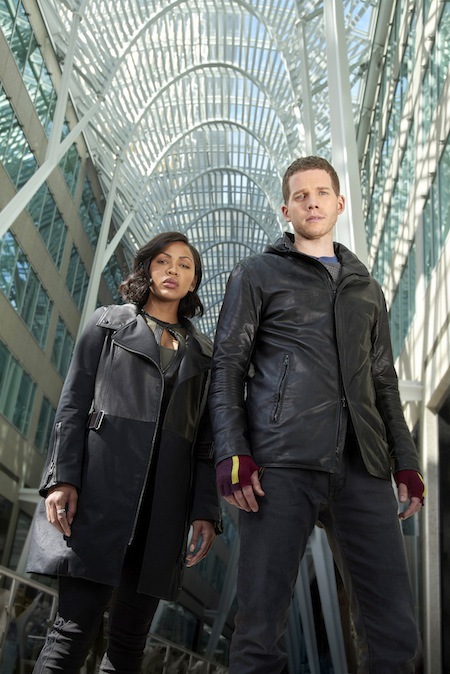 Fox’s new futuristic crime drama, MINORITY REPORT, is a follow-up, of sorts, to the 2002 Tom Cruise-led film, but thanks to the nature of television storytelling, the medium will allow the writers to dive deeper into the bigger ethical issues the movie introduced. But it’s complicated by the fact that one of the siblings, Dash, feels a responsibility to not let these warnings go unheard. And when he sets out to fix things, he runs into Detective Vega…who could be the perfect person to help him prevent crimes. 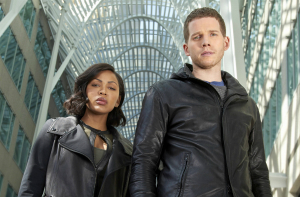 MINORITY REPORT — a continuation of the 2002 Tom Cruise-led film; in the Fox show, a cop (Meagan Good) teams up with a precog, Dash (Stark Sands), who is able to see the future, to prevent crimes — is expanding its world. The series added Nick Zano as a new series regular late last month — he’ll play Arthur, the fraternal twin brother of Dash — and at Comic-Con, executive producer Max Borenstein gushed to reporters about the opportunity to do a deep-dive into the twins’ lives. Borenstein added that due to Dash’s visions, he would, essentially be “an open wound” and the connection drives him to try and stop the crimes — whereas Arthur is able to keep things at a distance since he’s dealing with more of the factual information. MINORITY REPORT is set ten years after the events of the film of the same name and focuses on Dash, one of the three precognitives (precogs) from the movie. Still haunted by visions of the future, Dash secretly advises Detective Lara Vega to help stop the murders that he foresees. At the same time, the pair are trying to find Dash’s missing brother, Arthur. MINORITY REPORT stars Stark Sands, Megan Goode, Wilmes Valderrama, Laura Regan and executive producers Kevin Falls, Max Borenstein and Darryl Frank all participated in the Comic-Con panel. 2 BROKE GIRLS’ Nick Zano has joined MINORITY REPORT as a new series regular, a rep for the show has confirmed. Originally, MINORITY REPORT star Stark Sands was set to play identical twin brothers Dash and Arthur — now, the twins will be fraternal, and Zano will play Arthur. The upcoming Fox drama is based on the movie with the same title. As a Precog, Dash, teams up with a detective (played by Meagan Good) to help stop crimes he predicts. EW.com was first to report the casting. MINORITY REPORT premieres Monday, September 21st at 9 PM on Fox. 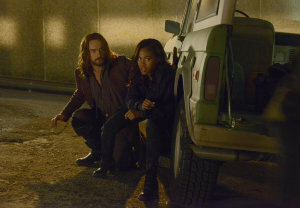 Fox has ordered two more dramatic (and genre) shows for the upcoming 2015-2016 season: THE MINORITY REPORT and LUCIFER have been picked up to series, the network announced. They join THE FRANKENSTEIN CODE, GRANDFATHERED, THE GUIDE TO SURVIVING LIFE, THE GRINDER, ROSEWOOD, SCREAM QUEENS, and THE X-FILES revival as the new additions to Fox’s lineup.